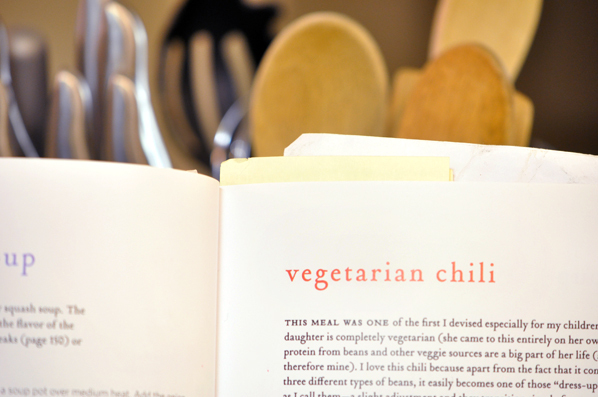 Vegetarian Chili recipe from Gwyneth Paltrow's, "My Father's Daughter," cookbook. My husband makes great chili. It’s a little too hot for my taste, but it really is good. But my husband is good at everything. It’s annoying. He does most things better than I do. SO! When I saw a vegetarian chili recipe in my new favorite cookbook, “My Father’s Daughter,” by Gwyneth Paltrow, I thought I would challenge my better half at his own game. And what better time to try out my new-found recipe than for dinner during the Bowl Championship Series (BCS) this year between Louisiana State University and Alabama – Roll Tide Roll, y’all! LSU and Alabama are fierce rivals. LSU won the only game Alabama lost during the regular season, so this was personal. This was the rematch of The Game of the Century. This was was important. THIS was SEC football at its best, and I wanted to make it special for my husband. After two hours of cooking, we sat down to eat dinner about 15 minutes before kickoff. It did indeed taste great – for the first 5 seconds. And then it hit. A heat hotter than anything I’ve ever tasted – including my husband’s chili. I got up and re-read the recipe: 1 can kidney beans – check! 1 can black beans – check! 1 can whole peeled tomatoes – check! 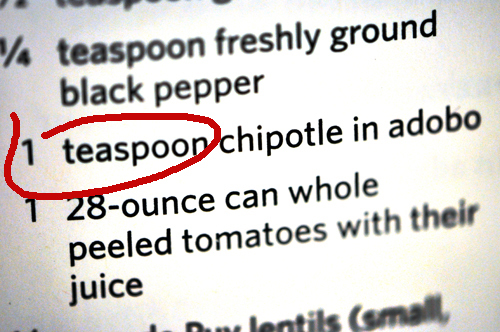 1 teaspoon chipotle in adobo – Huh? 1 teaspoon? I put in THE WHOLE CAN! Darn it! I was so used to seeing, “1 can,” I guess I just kept in that line of thinking. I was so mad at myself, and so disappointed that I had wasted so much time and money. AND I was ticked that I had failed at one-upping my husband – again! Meanwhile, my cell phone rang. I had to run downstairs to answer it, and stayed down there talking for a few minutes so not to disturb my husband’s pre-game viewing. When I went back upstairs to remove our dinner for our own safety, I walked in to see my husband sitting back in the chair with a distressed expression on his face. I looked down at his bowl of chili – he had eaten the entire thing. The game was great, too. For us, at least. I have never, EVER seen a football team’s defense stop the other team the way the Crimson Tide stopped LSU. It was a history-making game, for sure. As was my chili concoction. It will always be known as the BCS chili with which I tried to kill my husband. I don’t see my living this down anytime soon, either. Champy's on M.L. King Boulevard, Chattanooga, Tenn. The good news is the house my husband and I have been renovating for the past two years has finally sold. To celebrate the day we closed, we went to lunch with his sister at a fairly new restaurant in town called Champy’s. Even though I work one block away, I had never been to this restaurant before. They serve fried chicken, and lots of it. Oh, and blues music. But the decor is what caught my eye. 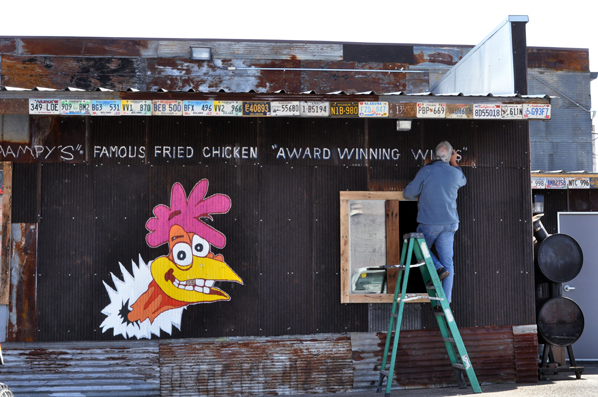 I went back the next day with my camera and caught this man painting part of the menu on the side of the building. I love places like this. They have a life of their own. But the main thing for me is it got me photographing again. It felt good. Meanwhile, I have become aware of a “new to us” photographer. Her name is Vivian Maier. She was a nanny in Chicago, and in her spare time wandered the streets taking photos. She had them developed – well, most of them I think – but NEVER showed them to anyone. Ever. She placed them in a storage unit years later; and when she was unable to keep up the payments, her belongings were auctioned off….thank Heavens! The man who purchased them discovered her images and has made them public. There are over 100,000 images. One book has been published so far, but it seems many volumes will be needed to display her wonderful work. I’m not sure she ever had any formal training in photography, but she was beyond good. I can only assume that since she never married or had a family of her own that she studied people on the street. I can picture her feeling invisible to them so she could uncover their personalities. At least that’s how I would handle it when I lived in New York. Unfortunately, she has passed away and will not see how her work has inspired and moved us. As much as I love Diane Arbus’s photography, I’m going to say I think Vivian was better. Well, Diane took a different approach. Vivian took street photos of strangers. It doesn’t see like she ever interacted with them. Or so the images make me think. Diane talked and interacted with her subjects – even followed them home. I think Vivian was more of an observer. All speculation on my part, of course.